It’s the end of another year and time for those time-honored New Year resolutions. We promise to drop weight, get healthy, fix our lives in one way or another and we swear to begin in one fell swoop in just one day. What I’ve learned in my forty-five years of experience is that often changes are that dramatic and what works better is a baby-step approach to forging forward with better goals that can last. Maybe it’s not what you need to add to your life this year but rather what you need to let go of that will make your life improve. Below, I’ve compiled my personal eighteen most critical changes for 2018. 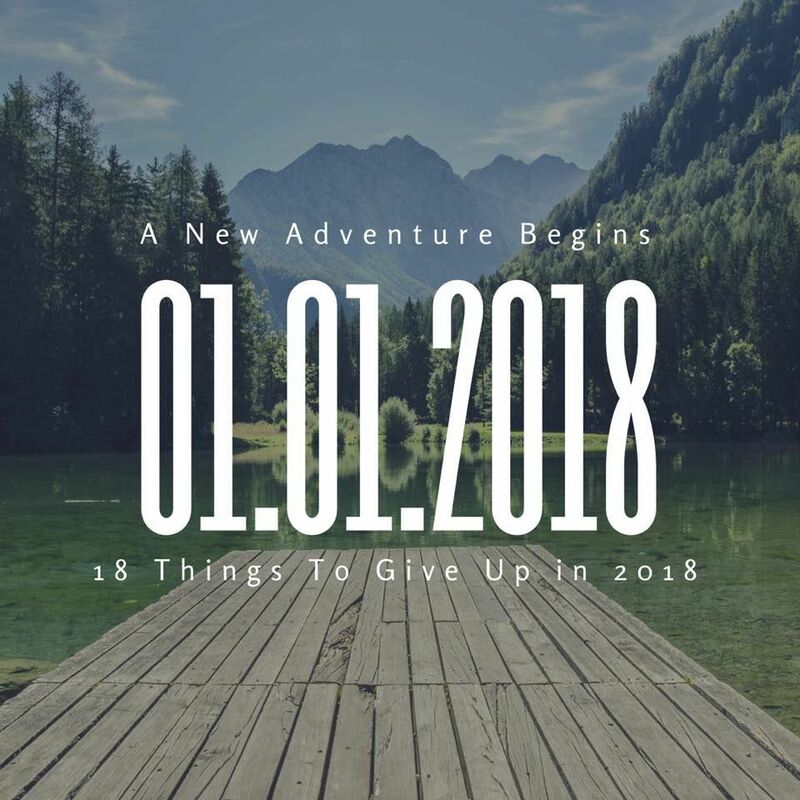 These are the items I think if many of us focused on letting go of we’d be happier, healthier and a lot more content for the rest of our life, not just the first few days of another year. It’s time to let go and start really living. Nothing will make you feel like you are more in a personal prison than living in debt. Debt limits your opportunity to do the things you want to do and live the kind of life you want to live. For however long it takes to get yourself out of debt you should aim to live by a few simple rules. Don’t consume anything that is not necessary and essential to life (think homemade food and a roof over your head). Don’t put anything on a credit card you can’t pay off at the end of the month. Once you live debt free, you won’t ever live any other way. I’m so guilty of this one. I’m ALWAYS busy, and if I’m honest, a lot of the things that keep me busy can wait or aren’t as important as I make them out to be. Instead of being busy this year, focus on 3-5 things you MUST do every single day and as long as you get those critical things done, consider your day a success. Part of feeling overwhelmed and busy simply is not focusing on the things that matter most. I’ve been saying this one for years. Everyone is so caught up with every new diet fad from Paleo to Atkins to Keto, low fat, non-fat and fat-free. What we should focus on is eating a WHOLE FOODS diet. If you focus on eating foods that are in their natural state and without processing your will give your body the very best present in 2018. When you eat processed foods you are giving your body chemicals it does not know how to handle. Those chemicals end up staying in your cells, your bloodstream, trapped in your liver and you end up gaining weight, and being unhealthy. Don’t focus on a diet, focus on eating food for life and that starts with just eating REAL FOOD in it’s most natural state. Want to learn more? Join our 8-Week Jump Start Challenge NOW and relearn about living healthy and eating well. Over the past many years I’ve realized that I can’t control other people’s happiness, I can only control my own. Give up trying to make everyone happy in 2018. Be your best self, live your best life and allow the people who can’t accept your journey to go peacefully off on their own. I just keep saying it but in 2018, really decide to give up the extra weight that you are carrying around in this life. All the extra stuff won’t make your life better; it will only clutter your mind, your home and your room for emotional growth. If you don’t need it, or it doesn’t bring you joy, get rid of it. I see it every day in the gym. People are using way too much weight, and for the most part, they are allowing momentum to do the work for them. In the process, they are potentially hurting their joints and their muscles, and they aren’t building new muscle like they hope to do. Less is more, even with weight. Start slow, always with good form and build up to more. You should never compromise your form to add more weight. For most exercises, you will need to keep your head neutral and your back flat, and you should be able to control the weight in both the concentric and eccentric positions. Go slow, get strong. Time under tension beats momentum in nearly all cases. Want to learn good form? Join our 8-Week Jump Start Challenge now and work with my team for your best 2018!! Join our upcoming 8-Week Challenge and learn from our team! You are the sum of the people you spend the most time with. Surround yourself with people who want to make a difference, grow and will encourage you to do the same. If your friends are complaining and are happy staying stuck, it may be time to source some new friends. You can still love the old ones but don’t let them hold you back from all you can be going into next year. They will drag you down; energy just works that way. I just laugh when people hate me on social media. Really? Why are you so invested in my life? Why do you care what I do day after day? Who understands your full journey? Who feels your emotions from joy to sorrow? Who cares what anyone thinks about your life? Do no harm, be kind, follow the golden rule and take no grief from anyone. It’s not the hater’s journey, and when you are on your deathbed, their opinion won’t mean a thing. We all make them, and we all need to stop. You can literally do anything you set your mind to, but you do have to decide to do the work. It’s not easy, and it will take dedication, but you have to stop letting yourself off the hook so quickly. Hard work leads to brilliant places. If you look at the many successful people in the world, they have several things in common. Most meditate, read, workout and lots of them get up very early. For me, the morning is a sacred time where the world is quiet, and nobody needs me. It’s a time for self-reflection, goal setting, and putting myself first before everyone else wants something from me. I typically read, meditate, listen to music, journal, stretch and write. I even have started making it the only time in the day where I check my email. After the morning I let the incoming go until the next day, and I focus on my 3-5 important items on my to-do list. I wish I could make everyone understand how important it is to EAT. I don’t want you to eat more junk food or more processed crap, but I’d love to see you eat more plant-based whole foods. Your body and your metabolism will love it when you feed it regularly and with quality foods that are full of vitamins and fiber. Want to catch your metabolism on fire, eat more often and better quality food. It may surprise you just how fast your body will respond. Grab a spot in our 8-Week Jump Start and take part in our metabolic reboot! One thing that death taught me is that nobody on this earth is responsible for my happiness or my direction other than me. You can’t expect anyone to save you and you can’t expect another human to make you happy. Find yourself, love yourself, grow within yourself before you partner with another. Stop worrying about what others are doing. Focus on what you are doing. Their success or failure has zero to do with you. Wish them well, put your nose down and get to work. The only way to succeed is to focus on your stuff. Social media, TV, youtube, and so much more. What if you stopped wasting time? What if you took that extra time to focus on reading a book you bought in 2017? What if you took that extra time to work on your fitness? What about purging the extra stuff in your life that holds you back? How much happier would you be at this point going into 2019? Nature is one of our greatest healers. It calms the soul, clears the mind and opens the heart. If you want to live a better life in 2018, spend life-time under fake lights and more time out in mother nature. Your life will never improve if you complain. Period. If you want your life to get better, you should start focusing on all the good you have in your life right now and then sit back and watch it multiply. The magical thing about a positive attitude is that it allows you start seeing all the good you otherwise were ignoring and you start to realize that everyone has rainy days but very few are willing to focus on the beauty of the rainbow. Within your body are millions of cells and when you hold onto anger, you are essentially telling your cells you want to be sick. Anger does nothing good for your body or your life. Make peace with what you can remember that forgiveness is more about you than the person you are forgiving and let go. Anger will only slow you down in life and keep you from reaching your real potential. This is my #1 thing to give up in 2018. It’s critical to a happy life. It’s vital to happy relationships. It’s essential to all we are. If you have no expectations, you will never be disappointed.